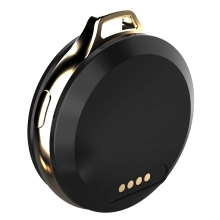 This mini GPS tracker is a perfect personal tracker. With GPS/LBS/WiFi accurate positioning and SOS function, which offers the best protection for kids, elders and pets in your family. It&apos;s very accurate and easy to use. You&apos;ll need to insert into a prepaid SIM card and download a specialized tracker APP to your phone, then you can use this awesome GPS tracker! Supports GPS/WiFi/LBS accurate positioning, and it will select the suitable positioning mode based on outdoor different environment. Supports SOS alarm, in case of emergency, elders and kids can long press SOS button, and then the preset phone number will be connected automatically. Supports setting electronic fence, when the tracker leaves your pre-set electronic fence, it will alarm to your phone APP immediately. Anti-lost function, allowing you through your phone APP to find out the device easily once you can&apos;t find the tracker. Supports historical tracking, the APP can query and retain information of 3 months, so you can check the walking route and time via the APP anywhere and anytime. 3D streetscape function and real time tracking, allowing you find out the location of your children/elder/pets through the APP map if they get lost. Allows you add multiple phone numbers and install the APP on different phones to realize multi-protections for your children/elder/pets. Built-in Micro-SIM card slot and it supports GSM card(2G) and 4G card(compatible with 2G network). Supports bidirectional communications, allowing you remote listen-in and it helps you hear what is happening around the tracking device. Mini design and compact size, noiseless when working, and it&apos;s small size allows it to be easily concealed. Super long 10 days standby time, and you can charge it through connecting the charging cable once it is no power. 1. Please read the user manual carefully before you use the tracker. 2. Please download the APP to your phone from user manual. 3. The device only works with Micro-SIM card and it supports GSM card(2G) and 4G card(compatible with 2G network), but not supports the snail card, millet card and other similar virtual card, also not supports Telecom card.